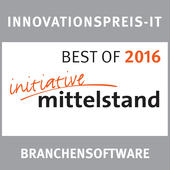 Kempen, Germany - The expert jury of the Initiative Small and Medium Enterprises under the auspices of the TÜV Nord Group has accorded the Innovation Award "Best of 2016" for the second year in succession to the consulting engineers Killet Software Ing.-GbR (KilletSoft) for their geodetic software as best IT solution. This year, even two geodetic programs from KilletSoft have received the coveted award. KilletSoft's Coordinate Transformation Program TRANSDATpro has been awarded in the category "Business Software". Besides the usual Geographic Information Systems (GIS), there is a wide variety of geodetic applications and data collections that are used for the acquisition, processing and presentation of spatial data. The thereby used spatial data are available in many different coordinate systems and reference systems. Here the program TRANSDATpro is needed to transform the spatial data of different data sources and data structures from one coordinate reference system (CRS) to another. KilletSoft's community directory and locality research ORTWIN has been awarded in the category "Applications". ORTWIN is a program for the country-wide inquiry of the cities and towns, localities, postal codes and dialing codes in Germany. It finds postal zip codes, dialing codes, coordinates and ground level elevations. The program determines municipal codes, local center points, car license codes, topographic maps, Unlocodes and much more. It arranges localities hierarchically into the structures federal state, administrative district, rural district, town, municipality, local quarter and domicile. The program performs perimeter searches and distance calculations. It finds landscapes on different levels, natural units and climatic data like snow- and wind load zones and solar irradiations of all localities. "We are very pleased that the Initiative Small and Medium Enterprises for the second time has given us this coveted prize. After being awarded in the last year we had a big increase in customers. This has inspired us to invest additional development power in the awarded software. The expert jury has rewarded our efforts by a renewed recognition." KilletSoft's Development Engineer Fred Killet explains. To have a closer look to the detailed descriptions of the programs TRANSDATpro and ORTWIN in English language, visit KilletSoft's website at http://www.killetsoft.de. There you can also view the certificates issued for the innovation awards.